The four parts of the kingdom—the Netherlands, Aruba, Curaçao and Sint Maarten—are constituent countries (landen in Dutch) and participate on a basis of equality as partners in the kingdom. In practice, however, most of the kingdom’s affairs are administered by the Netherlands—which comprises roughly 98% of the kingdom’s land area and population—on behalf of the entire kingdom. Consequently, the Caribbean Sea islands countries of Aruba, Curaçao, and Sint Maarten are dependent on the Netherlands for matters like foreign policy and defence, although they are autonomous to a certain degree, with their own parliaments. The Kingdom of the Netherlands originated in the aftermath of French Emperor Napoleon I‘s defeat in 1815. In the year 1815, the Netherlands regained its independence from France under its First French Empire, which had annexed its northern neighbor in 1810, as the Sovereign Principality of the United Netherlands. The great powers of Europe, united against Napoleonic France, had decided in the secret treaty of the London Protocol to establish a single state in the territories that were previously the Dutch Republic/Batavian Republic/Kingdom of Holland, the Austrian Netherlands and the Prince-Bishopric of Liège, awarding rule over this to William, Prince of Orange and Nassau, although the southern territories remained under Prussian (German) rule until Napoleon’s return from his first exile on Elba (“Hundred Days”). In March 1815, amidst the turmoil of the Hundred Days, the Sovereign Prince William of Orange and Nassau adopted the style of “King of the Netherlands“. Following Napoleon’s second defeat at the Battle of Waterloo in June 1815, the Vienna Congress supplied international recognition of William’s unilateral move. The new King of the Netherlands was also made Grand Duke of Luxembourg, a part of the Kingdom that was, at the same time, a member state of the German Confederation. The origin of the administrative reform of 1954 was the 1931 Statute of Westminster and the 1941 Atlantic Charter (stating the right of all peoples to choose the form of government under which they will live, and the desire for a permanent system of general security), which was signed by the Netherlands on 1 January 1942. Changes were proposed in the 7 December 1942 radio speech by Queen Wilhelmina. In this speech, the Queen, on behalf of the Dutch government in exile in London, expressed a desire to review the relations between the Netherlands and its colonies after the end of the war. After liberation, the government would call a conference to agree on a settlement in which the overseas territories could participate in the administration of the Kingdom on the basis of equality. Initially, this speech had propaganda purposes; the Dutch government had the Dutch East Indies (now Indonesia) in mind, and hoped to appease public opinion in the United States, which had become skeptical towards colonialism. After Indonesia became independent, a federal construction was considered too heavy, as the economies of Suriname and the Netherlands Antilles were insignificant compared to that of the Netherlands. By the Charter for the Kingdom of the Netherlands, as enacted in 1954, a composite state was created, also known as the “Tripartite Kingdom of the Netherlands”, consisting of the Netherlands (mainland), Suriname and the Netherlands Antilles. Under the provisions of the Charter, both former colonies were granted internal autonomy. Suriname and the Netherlands Antilles each got a Minister Plenipotentiary based in the Netherlands, who had the right to participate in Dutch cabinet meetings when it discussed affairs that applied to the Kingdom as a whole, when these affairs pertained directly to Suriname or the Netherlands Antilles. Delegates of Suriname and the Netherlands Antilles could participate in sessions of the First and Second Chamber of the States General. An overseas member could be added to the Council of State when appropriate. According to the Charter, Suriname and the Netherlands Antilles were also allowed to alter their “Basic Law”s (Staatsregeling). The right of the two autonomous countries to leave the Kingdom, unilaterally, was not recognised; yet it also stipulated that the Charter could be dissolved by mutual consultation. 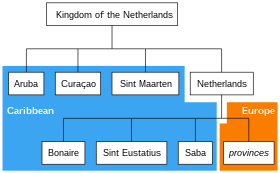 Before the Charter for the Kingdom of the Netherlands was proclaimed in 1954, Suriname, Netherlands New Guinea, and the Netherlands Antilles, formerly “Colony of Curaçao and subordinates” (Kolonie Curaçao en Onderhorige Eilanden) were colonies of the Netherlands. 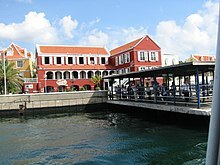 In 1969, an unorganised strike on the Antillean island of Curaçao resulted in serious disturbances and looting, during which a part of the historic city centre of Willemstad was destroyed by fire. Order was restored by Dutch marines. In the same year, Suriname saw serious political instability with the Surinamese prime minister, Jopie Pengel, threatening to request military support to break a teachers’ strike. Aruba, with its own constitution, is a representative parliamentary democracy organised as a unitary state. Its administration consists of the Governor, who represents the Monarch, and of the (Aruban) Council of Ministers, headed by a Prime Minister. The sovereign people of Aruba are represented by 21 parliamentarians in the Parliament of Aruba. The Governor of Aruba is Alfonso Boekhoudt, and the Prime Minister is Evelyn Wever-Croes. It has its own Central Bank and currency, the Aruban florin, linked to the US dollar; the US dollar is accepted almost everywhere on the island. The country of Aruba has two official languages: its own national language Papiamento and the Kingdom of the Netherlands’ Dutch language. Two legal instruments are available at the Kingdom level: the Kingdom act (Dutch: Rijkswet) and the Order-in-Council for the Kingdom (Dutch: Algemene maatregel van Rijksbestuur). An example of a Kingdom act is the “Kingdom Act regarding Dutch citizenship” (Dutch: Rijkswet op het Nederlanderschap). Article 13 of the Charter specifies that there is a Council of State of the Kingdom. It is (as all institutions of the Kingdom) regulated in the Constitution, but the Charter implies that at the request of Aruba, Curaçao, or Sint Maarten, a member from each of these islands can be included in the Council of State. Aruba is currently exercising this right. This has not always been the case; the Netherlands Antilles had no member until 1987 and Aruba had none until 2000. Sint Maarten’s first member of the Council of State will be former Lieutenant Governor Dennis Richardson. According to Article 39 of the Charter, “civil and commercial law, the law of civil procedure, criminal law, the law of criminal procedure, copyright, industrial property, the office of notary, and provisions concerning weights and measures shall be regulated as far as possible in a similar manner in the Netherlands, Aruba, Curaçao and Sint Maarten”. The Article further stipulates that when a drastic amendment of the existing legislation in regard to these matters is proposed, the proposal shall not be submitted to or considered by a representative assembly until the Governments in the other countries have had the opportunity to express their views on the matter. In case of a conflict between a constituent country and the Kingdom, Article 12 of the Charter prescribes an administrative reconciliation procedure. This was often deemed a democratic deficit of the Kingdom, leading to the adoption of an amendment to the Charter, which entered into force on 10 October 2010. The new Article 12a specifies that in addition to the administrative reconciliation procedure, “by Kingdom Act measures shall be made allowing for the arbitration of certain conflicts, as specified by Kingdom Act, between the Kingdom and the countries.” The imperative formulation was the result of an amendment in the Chamber of Representatives by special delegates Evelyna Wever-Croes and J.E. Thijsen of Aruba; the original formulation was “by Kingdom Act measures can be made”. Paragraph 2 of Article 3 specifies that “other matters may be declared to be Kingdom affairs in consultation”. Article 26 specifies that when Aruba, Curaçao, or Sint Maarten communicate their wish for the conclusion of an international economic or financial agreement that applies solely to the country concerned, the Government of the Kingdom shall assist in the conclusion of such an agreement, unless this would be inconsistent with the country’s ties with the Kingdom. The Kingdom’s federal characteristics include the delineation of Kingdom affairs in the Charter, the enumeration of the constituting parts of the Kingdom in the Charter, the fact that the Charter subordinates the law of the constituting countries to the law of the Kingdom, the establishment of Kingdom institutions in the Charter, and the fact that the Kingdom has its own legislative instruments: the Kingdom act and the Order-in-Council for the Kingdom. Its confederal characteristics include the fact that the Charter can only be amended by consensus among the constituent countries; in most ordinary federations, the federal institutions themselves can change the constitution. Characteristics that point more or less to a federacy include the fact that the functioning of the institutions of the Kingdom is governed by the Constitution of the Netherlands where the Charter does not provide for them. The Charter also does not provide a procedure for the enactment of Kingdom acts; articles 81 to 88 of the Constitution of the Netherlands also apply for Kingdom acts, be it with some additions and corrections stipulated in articles 15 to 22 of the Charter. The only Kingdom institution that requires the participation of the Caribbean countries in a mandatory way is the Council of Ministers of the Kingdom; both the Supreme Court and the Council of State of the Kingdom only include Caribbean members if one or more Caribbean countries ask for it, and the Caribbean countries are almost completely excluded from participating in the Kingdom’s legislature. They can, however, participate in the drafting of a Kingdom act and their Ministers Plenipotentiary can oppose a Kingdom act otherwise supported by the Kingdom government in front of the Kingdom’s parliament. Furthermore, according to article 15 of the Charter, the Ministers Plenipotentiary can request the Kingdom parliament to introduce a draft Kingdom act. Constitutional scholar C. A. J. M. Kortmann speaks of an “association of countries that has characteristics of a federation, yet one of its own kind.” Belinfante and De Reede do speak about a “federal association” without any reservations. 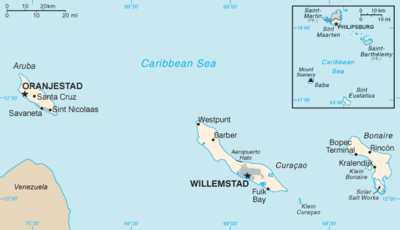 In 2004, a joint commission proposed major reforms for the Netherlands Antilles. On 11 October and 2 November 2006, agreements were signed between the Dutch government and the governments of each island that would put into effect the commission’s findings by 15 December 2008. The reform took effect on 10 October 2010. Under these reforms, the Netherlands Antilles were dissolved and Curaçao and Sint Maarten became constituent countries within the Kingdom of the Netherlands, obtaining the same status as Aruba which seceded from the Netherlands Antilles in 1986. The BES islands (i.e., Bonaire, Saba, and Sint Eustatius) became direct parts of the Netherlands, which is itself the major constituent country of the Kingdom. As special municipalities, they were constituted as “public bodies” (Dutch: openbare lichamen) under the Constitution for the Kingdom of the Netherlands. These municipalities resemble ordinary Dutch municipalities in most ways (e.g., they will have mayors, aldermen, and municipal councils) and will have to introduce most laws of the Netherlands. As a transitional measure, only law applicable to the Netherlands that is considered to be necessary to function within the legal system of the Netherlands was introduced, and most laws of the Netherlands Antilles remained in force when the BES islands they joined the Netherlands on 10 October 2010. Since that date, Dutch legislation is projected to slowly replace Netherlands Antilles laws. Nevertheless, some derogations will persist: e.g., social security will not be on the same level as in the European part of the Netherlands, and it is uncertain whether the islands will introduce the euro. Outside the Kingdom of the Netherlands, “Netherlands” is used as the English short-form name to describe the Kingdom of the Netherlands. At the United Nations, for example, the Kingdom is identified in the General Assembly by its English short-form name “Netherlands”, whereas the English long-form name “Kingdom of the Netherlands” may be used in place of the name “Netherlands” in formal UN documentation. International treaties, also, frequently shorten “Kingdom of the Netherlands” to “Netherlands”. The Dutch name that is commonly used is Nederland, which is a singular form, whereas the official Dutch name Koninkrijk der Nederlanden like the English “(Kingdom of the) Netherlands”, uses the plural form. In Dutch practice, however, “Kingdom of the Netherlands” is shortened to “Kingdom” and not to “Netherlands”, as the latter name could be confused with the Kingdom’s principal constituent country rather than with the Kingdom in its Charter capacity. [nb 5] The Charter for the Kingdom of the Netherlands also shortens “Kingdom of the Netherlands” to “Kingdom” rather than to “Netherlands”. Apart from the fact that referring to the Kingdom of the Netherlands as the “Netherlands” can be confusing, the term “Kingdom” is also used to prevent any feelings of ill will that could be associated with the use of the term “Netherlands.” The use of the term “Netherlands” for the Kingdom as a whole might imply that Aruba, Curaçao, and Sint Maarten are not equal to the Kingdom’s country in Europe and that the three island countries have no say in affairs pertaining to the Kingdom but are instead subordinate to the European country. Though the influence of the islands in Kingdom affairs is limited, it certainly exists. Talking about the negotiation tactics of then Minister for Kingdom Affairs Alexander Pechtold, ChristenUnie leader and then demissionair Deputy Prime Minister of the Netherlands André Rouvoet illustrated the sensitivity in this matter by remarking in the House of Representatives that “[…] the old reproof that constantly characterised the relationship between the Netherlands and the Antilles immediately surfaced again. The Netherlands identifies the Kingdom with the Netherlands and dictates. The Netherlands Antilles can like it or lump it.” In addition, the Werkgroep Bestuurlijke en Financiële Verhoudingen Nederlandse Antillen—the commission that explored the current constitutional reform of the Kingdom—recommended that the “identification of the Netherlands with the Kingdom needs to be eliminated”. The Council of State of the Kingdom joins the commission in this by remarking that the Kingdom of the Netherlands has no telephone number, no budget and that the Council of Ministers of the Kingdom usually meets very briefly with a summary agenda. To counter this habit, the Council of State has suggested that with the pending constitutional reform in the Kingdom, a Secretariat for the Kingdom will be instituted that prepares the agenda for the Council of Ministers of the Kingdom and guards the enforcement of decisions of the Council. ^ The Prime Minister of the Netherlands is referred to as “Our Prime Minister, in his capacity as chairman of the Council of Ministers of the Kingdom” (Dutch: Onze Minister-President, in zijn hoedanigheid van voorzitter van de raad van ministers van het Koninkrijk) when he acts as a Minister of the Kingdom. An example of this can be found in article 2(3a) of the Act on financial supervision for Curaçao and Sint Maarten. Other ministers of the Netherlands are referred to with the additional line “in his capacity as Minister of the Kingdom” (Dutch: in zijn hoedanigheid van Minister van het Koninkrijk) when they act as Kingdom Ministers, as for example with “Our Minister of Justice in his capacity as Minister of the Kingdom” (Dutch: Onze Minister van Justitie in zijn hoedanigheid van minister van het Koninkrijk), except for the Minister of Foreign Affairs and the Minister of Defence, since they always act in a Kingdom capacity. For more information on this, see Borman 2005 and Borman 2010. ^ Not to be confused with the constituent country the Netherlands, which is only a part of the Kingdom. In some contexts “the Netherlands” refers to the constituent country, in more formal contexts it may refer to the Kingdom. ^ Examples of this practice can be found in all government documents and in nearly all press reports on Kingdom affairs, as well as in institutions that are related to the Kingdom of the Netherlands: Raad van Ministers van het Koninkrijk (“Council of Ministers of the Kingdom”), Ministerie van Binnenlanse Zaken en Koninkrijksrelaties (“Ministry of the Interior and Kingdom Affairs”), the Koninkrijksspelen (“Kingdom Games”, the Dutch equivalent of the Commonwealth Games), etc. ^ a b “LANDSVERORDENING van de 28ste maart 2007 houdende vaststelling van de officiële talen (Landsverordening officiële talen)” (in Dutch). Government of the Netherlands. 2010-10-10. Retrieved 30 July 2013. ^ a b “Invoeringswet openbare lichamen Bonaire, Sint Eustatius en Saba” (in Dutch). wetten.nl. Retrieved 27 December 2017. ^ “Wet gebruik Friese taal” (in Dutch). wetten.nl. Retrieved 27 December 2017. ^ “Welke erkende talen heeft Nederland?” (in Dutch). Rijksoverheid. 2016-01-11. Retrieved 29 December 2018. ^ “Koning en Koningin bij viering 200 jaar Koninkrijk in Maastricht”. Dutch Royal House. Archived from the original on 2 April 2015. ^ “Monetary, Safety Law BES islands approved islands”. The Daily Herald. 19 May 2010. Archived from the original on 10 August 2010. Retrieved 27 June 2011. ^ “The Bonaire Insider – InfoBonaire”. ^ “Aruba and the Kingdom”. Aruba Government. 5 April 2017. ^ a b c d e f g h i j k l m n “Coming Soon”. www.arubaforeignaffairs.com. ^ a b “Aruba and the Netherlands Antilles: Political relations within the Kingdom of the Netherlands”. Ministerie van Binnenlandse Zaken en Koninkrijksrelaties. Archived from the original on 17 February 2008. Retrieved 13 October 2007. ^ a b c d e f H.G. Hoogers (2008) “De landen en het Koninkrijk”, in Schurende rechtsordes: over juridische implicates van de UPG-status voor de eilandgebieden van de Nederlandse Antillen en Aruba, Groningen: Faculteit rechtsgeleerdheid van de Rijksuniversiteit Groningen, pp. 119–124. This study was mandated by the Dutch State Secretary for Kingdom Relations and was used for government policy. ^ “De in het statuut neergelegde staatsvorm heeft een uniek karakter en is moeilijk in een bepaalde categorie onder te brengen […] Veelal wordt dan ook geconcludeerd dat het Koninkrijk niet van een duidelijke classificate kan worden voorzien. Gesproken wordt van een quasi-, dan wel pseudo-federatie of van een constructie sui generis“, in: C. Borman (2005) Het Statuut voor het Koninkrijk, Deventer: Kluwer, pp. 23–24. ^ “Een poging om de structuur van het Koninkrijk samen te vatten leidt tot de volgende omschrijving: een vrijwillig samengaan van autonome landen in een boven die landen geplaatst soeverein Koninkrijk, waarbij de organen van het Koninkrijk grotendeels samenvallen met die van het grootste land, op het niveau van het Koninkrijk slechts enkele taken worden verricht en vanwege het Koninkrijk een beperkte invloed kan worden uitgeoefend op het autonome bestuur in de kleinere landen”, in: C. Borman (2005) Het Statuut voor het Koninkrijk, Deventer: Kluwer, p. 24. ^ “associatie van landen die trekken heeft van een federatie (Bondsstaat), maar wel een eigensoortige”, in: C. A. J. M. Kortmann (2005) Constitutioneel recht, Deventer, p. 107. ^ Staff reporter (13 February 2007). “Agreement on division of Netherlands Antilles”. Government.nl. Archived from the original on 12 March 2007. Retrieved 24 February 2007. ^ a b c The Daily Herald (12 October 2006). “St. Eustatius, Saba, Bonaire and The Hague Reach Historic Agreement”. Retrieved 21 October 2006. ^ André Rouvoet (12 October 2005). “Bijdrage debat Begroting Koninkrijksrelaties 2006” (in Dutch). ChristenUnie.nl. Archived from the original on 6 May 2009. Retrieved 21 October 2007. Hoewel Minister De Grave er wat ons betreft meer vaart achter had mogen zetten, had hij onmiskenbaar de goede richting te pakken én, dat is in Koninkrijkszaken cruciaal, de goede toon. Zijn opvolger, Minister Pechtold, bleek die broodnodige prudentie te ontberen met als dieptepunt zijn brief van 24 augustus waarin hij staatkundige veranderingen afhankelijk maakte van financiële verbeteringen. Het oude verwijt dat steeds de relatie tussen Nederland en de Antillen heeft gekenmerkt, speelde onmiddellijk weer op. Nederland vereenzelvigt het Koninkrijk met Nederland en dicteert. De Nederlandse Antillen moeten slikken of stikken. Gevolg: ergernis in de West, verstoorde verhoudingen en verlies van momentum; geen frisse wind, maar meer een storm in de Caribische porseleinkast. Het zal allemaal wel te maken hebben met de behoefte van deze minister om te zeggen wat hij denkt en heilige huisjes niet te sparen, maar echt behulpzaam voor de verhoudingen in het Koninkrijk is het niet. ^ Werkgroep Bestuurlijke en Financiële Verhoudingen Nederlandse Antillen (8 October 2004). “Nu kan het… nu moet het! Advies Werkgroep Bestuurlijke en Financiële Verhoudingen Nederlandse Antillen” (PDF) (in Dutch). pp. 37–38. Retrieved 21 October 2007. Aanbevelingen Koninkrijk “Nieuwe Stijl”: […] 7. De vereenzelviging van Nederland met het Koninkrijk wordt doorbroken. ^ Raad van State van het Koninkrijk (18 September 2006). “Voorlichting overeenkomstig artikel 18, tweede lid, van de Wet op de Raad van State inzake de hervorming van de staatkundige verhoudingen van de Antilliaanse eilanden binnen het Koninkrijk” (PDF) (in Dutch). pp. 34–35. Retrieved 21 October 2007. Het Koninkrijk der Nederlanden heeft geen adres of telefoonnummer en al evenmin een eigen budget. Als het Koninkrijk wordt gebeld, krijgt men Nederland aan de lijn. De relaties binnen het Koninkrijk zijn vooral een dynamisch onderhandelingsproces. Een democratisch gelegitimeerd centrum ontbreekt. Het duidelijkst geldt dit voor de rijksministerraad, die gewoonlijk slechts zeer kortstondig beraadslaagt, met een zeer summiere agenda en met weinig discussie over de koers van het Koninkrijk als geheel. Voor de voorbereiding is de raad vrijwel geheel afhankelijk van (voorbereidend) overleg tussen vertegenwoordigers van de drie landsregeringen.